I was gone for so long it had to wait till now to release it. doing each part to be able to overlap them as the scan was. up making this flower field type bg with the sun rays shining on them. I can't help but do the same...especially since it's Clannad, it's so warmhearting. PNG can be found at EDD! I'm so happy! I don't know why but since I saw it I can't stop smiling! And I knew it was yours! First of all, thank you so so much for the dedication, I don't think I even need to tell you how much I love it. You know what a hopeless Clannad fangirl I am! The vector looks beautiful...(must have PNG! 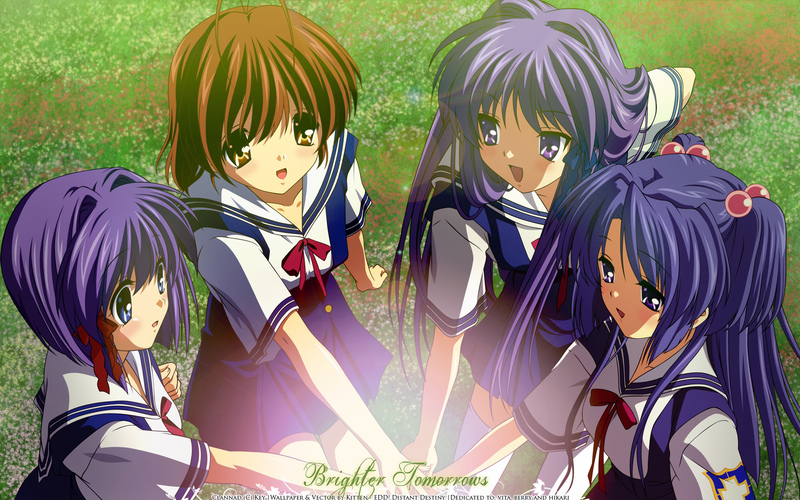 )...that's more Clannad girls than I've ever vectored at a time :P It looks flawless, including their eyes! The background is perfectly suited for Clannad. Like, if the original scan looked like this I wouldn't have been surprised. The green light-bloom from the center to across the picture looks awesome. Sorry I have to put another comment. My server cut me off and I lost my credit. But I do like how the light-bloom matches the background. Really great vector. And I love the flower field background. It give sthe whole wallpaper a total other feeling than the original scan. It looks so cool! Great work! XD Thank you for posting it! sigh finally commenting after.. a really long time! i love the field and the vector is pure awesomeness, its so cute that we are all like TOGETHER kind of haha, i can feel the happiness coming from this scan me you hikari and berry! except i dont fit in because im too angry D<. Yeah! the clannad puff girlz! Cute! They're certainly working towards a better tomorrow.